This is one of a four part series. I will link each current diary to the preceding one. I’m also giving an original song to listen to while reading. I wrote it over a period of roughly two years about Wounded Knee. Feel free to download it and put it to good use. First, vital parts of understanding the Wounded Knee Massacre of 1890, are preexisting conditions, Wovoka, and the Ghost Dance. at Wounded Knee in 1890 (here are some photos of the Massacre). Sitting Bull had been recently assassinated, yet they chose to peacefully dance, believing their way of life, the buffalo, and the land would be returned to them. They chose dancing the Ghost Dance in winter snow over revenge. They stood earnestly by their convictions, even up until the moment that the soldiers started it with (see paragraph mentioning Black Coyote in future diary). Likewise in the future, Leonard Crow Dog would bring it back temporarily during the 1973 Siege of Wounded Knee. The Ghost Dancers believed their shirts were bullet proof, and that their way of life would be returned. To understand some of why they believed those things; one needs to understand what was believed about Wovoka. In his early adulthood, Wovoka gained a reputation as a powerful shaman. He was adept at magic tricks. One trick he often performed was being shot with a shotgun, which may have been similar to the bullet catch trick. Reports of this trick may have convinced the Lakota that their “ghost shirts” could stop bullets. Padre Pio about 30 years later. I heard an elder talk about Wovoka having the Stigmata, as well as the intent behind the Ghost Dance. It was nothing but peaceful, though it was controversial to many who did not participate. 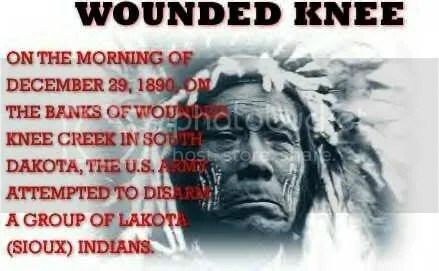 It hasn’t been done since the 1973 Siege of Wounded Knee. “Jesus is now upon the Earth,” he stated. But again, there is historic contradiction here- Wovoka is quoted as saying he was Christ and he wasn’t Christ. It would seem that either he excelled at playing to different audiences or was damned to being preserved by faulty historians. Do not hurt anybody or do harm to anyone. You must not fight. Do not refuse to work for the whites and do not make any trouble with them. While the Ghost Dance is sometimes seen today as an expression of Indian militancy and the desire to preserve traditional ways, Wovoka’s pronouncements ironically bore the heavy mark of popular Christianity. (Matthew 26:51-52): And, behold, one of them which were with Jesus stretched out his hand, and drew his sword, and struck a servant of the high priest’s, and smote off his ear. Then said Jesus unto him, Put up again thy sword into his place: for all they that take the sword shall perish with the sword. This entry was posted on Saturday, October 6th, 2007 at 7:52 am and is filed under Uncategorized. You can follow any responses to this entry through the RSS 2.0 feed. Responses are currently closed, but you can trackback from your own site.